Siem Lelum (Respected House) will provide 40-45 units of safe and affordable residential housing for Aboriginal single young adults (19-25) who are working and/or in school, young families and grandparents raising grandchildren, who are, or are at risk of becoming homeless, who will benefit from living in a supportive environment where they can learn parenting skills and other life skills necessary for self sufficiency. The primary purpose of this project is to create a safe, affordable, supported and holistic "Urban Village” where life long skills and a healthy life style will be modeled, and the necessary resources provided to encourage healthy choices. Creating 40-45 units of housing for Aboriginal people will assist the CRD in achieving its goal of eliminating homelessness in the region. Empowering Aboriginal people on the traditional lands of the Coast Salish People, and helping them to regain health and pride of belonging will go a long way towards bridging the gap that exists between the Aboriginal community and non-Aboriginal community. 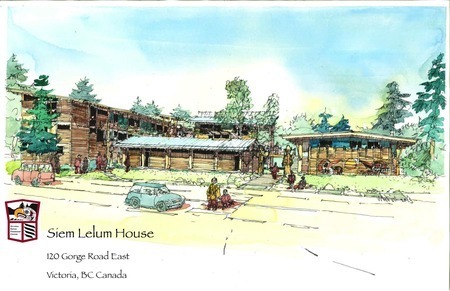 Siem Lelum (Respected House) will provide opportunities for Aboriginal people to forge relationships and bonds with their peers, which is particularly important given that many Aboriginal people feel isolated in Urban centers. Once people believe that change can happen, momentum can be created and people can become more proactive at implementing change in their daily lives. Certainly, Aboriginal people have it within themselves to move themselves forward. They also have the capacity within themselves to heal (need to understand that they are not defined by the past and what others have done to them, but by what they do to better themselves and improve their daily lives. Applications will remain active for 6 months unless applicant updates. All VNFC Housing properties are pet free (unless already stated). Application forms are also available through, Hulitan Family & Community Services Society, the Ministry of Children & Family Development, NIL/TU,P Child & Family Services, and the Band Offices of First Nations located within the Greater Victoria Region.